Mountain lion. Photo: California Department of Fish and Game.A few weeks ago, in the middle of the night, a mountain lion roamed the streets of Berkeley. The lion jumped fences, leaped through a school playground, and ran though several backyards. The Berkeley Police deemed the mountain lion a threat to public safety, and shot it in a resident’s driveway. When I first heard about this story, was surprised that the mountain lion was in such an urban area—and that it was shot rather than tranquilized and moved to a more suitable habitat. But after a bit of research, I learned that tranquilization is never an option in situations like this—it takes up to 30 minutes for the tranquilizer to take effect, during which time the situation could turn much worse. Wardens with the California Department of Fish and Game don’t even carry tranquilizers; Berkeley Police sure don’t carry tranquilizers, either. And, Fish and Game does not relocate wild animals that display this kind of bold behavior, because they’re still too much of a threat. These policies make sense—and so does a mountain lion walking in streets of Berkeley, when you really think about it. 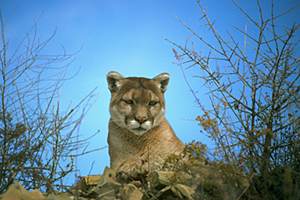 Over 50% of California is mountain lion habitat. Mountain lions can be found wherever there are deer, their main prey item. As we humans have built houses and highways, we’ve broken up the mountain lions’ habitat into fragmented patches. To move between patches of habitat, mountain lions have to cross our streets and highways. Mountain lions are territorial, and their territories tend not to overlap; these animals need a lot of space. My friend Chris Wilmers, a professor at UC Santa Cruz, studies mountain lion movement and behavior. He catches mountain lions and fits them with GPS-accelerometer collars, which record their every movement. He’s learning how the lions move through the landscape. You can learn more about his research, and the Bay Area Puma Project, in QUEST’s Tracking Urban Lions. Chris’s research will show us which areas the mountain lions are using, and how we can connect these habitat fragments, so mountain lions can move safely from patch to patch. Last week, the plight of urban lions came close to home—or rather, close to work. I work at the Lawrence Hall of Science, in the hills above the UC Berkeley campus. I found out, via email, that three mountain lions, probably a mother and two juveniles, have been seen several times near the Lawrence Berkeley Lab, just down the slope from where I work. And, two dead deer and one dead goat found near the Lab’s buildings strongly suggest that the lions aren’t just taking an evening stroll. Clearly, we coexist with mountain lions. Our habitat is their habitat. But there are things we can do to prevent encounters; fill your garden with plants that deer find distasteful, so mountain lions won’t be tempted to stalk their prey in your backyard. (See A Gardener’s Guide to Preventing Deer Damage.) Don’t leave food outside for pets. Don’t leave pets outside, or run or bike alone, at dawn, dusk, or nighttime, when mountain lions hunt. And, if you do encounter a mountain lion, stand tall, make noise, and fight back. Find more info here. Until Chris figures out where we should build wildlife corridors, I’ll be sure not to walk alone from my office to my car during darkling hours; one more reason not to work late!